Built in 2005, Lake Place West provides lakeside homes of exceptional workmanship and beautiful surroundings. 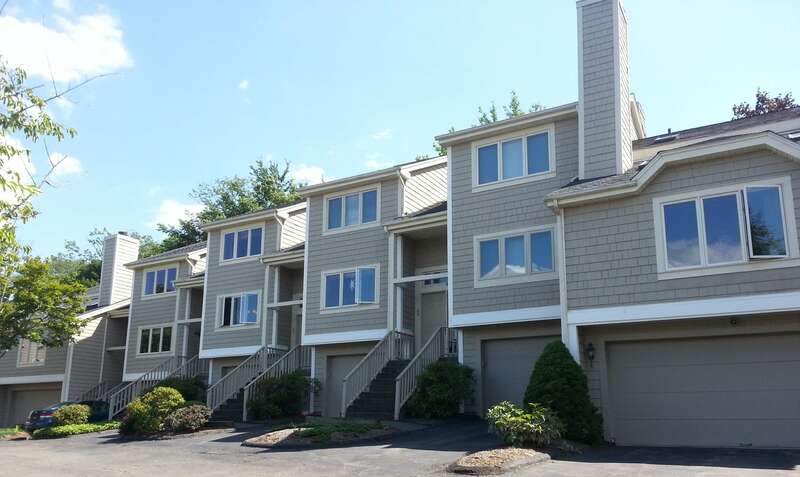 These Condos are located on Boulevard Drive in Danbury. The 14 detached townhouses are located in Danbury, CT, close to Lake Kensosia. With 1,973 to 2,430 square feet of light and airy living space, units have three bedrooms and three and one half bathrooms. The living room, with hardwood floors, crown moldings, and a fireplace, flows easily into the dining area and gourmet kitchen. The nine foot ceilings in the living areas give light and space. The eat-in gourmet kitchen features cherry custom cabinets, stainless steel appliances, granite counters, and built-in microwave ovens. Sliders from the family room provide access to your all weather deck, with views of the hills and valleys. The master suite, located on the main floor, has a walk-in closet. The huge master bath comes with a whirlpool tub, granite topped vanities, and open shower stall. Plenty of storage is provided in your full walk out basement and in your two car attached garage. Heated with gas and cooled by central air condition, you will always be comfortable in your home. Lake Place West is close to the Danbury Fair Mall, the largest mall in Connecticut. A short drive will bring you to Route 84, the major east/west freeway with access to New York City and Hartford, Connecticut.